Whether you bring home a cooler-full of elk or not, take time to soak in the heat and healing water at Iron Mountain Hot Springs in Glenwood Springs, Colorado where hunters are always welcome. As anyone who has trekked around for hours in the cold and snow, hiked through black timber looking for “sign,” or packed out an animal after dark with only the glow of headlamp knows—hunting is grueling. Right now hunting season is in full swing in and around Glenwood Springs. Late fall is the peak of big game season, especially for mule deer and elk. The White River National Forest surrounding the town is home to robust herds of both. In fact, as a hot springs town located in the heart of Colorado’s 23 million square miles of public lands that include national and state forests, state trust lands and state wildlife areas, it’s no wonder Glenwood Springs is a base camp for sportsmen and women. October and November snowfalls in the high country are a mixed blessing. On the one hand, snow makes it easier to visually spot herds and track individual animals; on the other, temperatures are frequently below freezing. While seasoned hunters know how to dress for warmth, when it comes to firing a shot or dressing out an animal—it’s gloves off. That’s where Iron Mountain Hot Springs in Glenwood Springs, CO comes in. We love our hunters who travel from near and far for the chance of stocking the freezer and maybe scoring a trophy mount. We also know the Colorado climate can be brutal, especially if you’re stalking prey from dawn to dusk. Even if it’s an off year and you don’t have a successful hunt, chances are all those hours spent on your feet have left you stiff and sore with muscle aches and pains. Recharge your batteries before heading home in the geothermal water at Iron Mountain Hot Springs. Colorado’s newest hot springs has 16 individual soaking pools that range in temperature from 98° to 108°F. The combination of the heat and the dissolved minerals in the water will work wonders for fatigued muscles. Plan to spend a few hours to allow the benefits of soaking to soothe and restore your body before you return home to the everyday grind. For added relaxation, enjoy a cold beer while you soak. While you can’t bring in your own, the Sopris Café, Iron Mountain’s on-site restaurant, stocks all of your favorite brews including Colorado craft beer as well as other adult beverages. If you have someone waiting for you at home, stop by the boutique in the bathhouse for an easy-to-pick-up memento. Not much of a shopper? You can’t go wrong with logoed stemless wine glasses, t-shirts or beautiful custom made soaps. 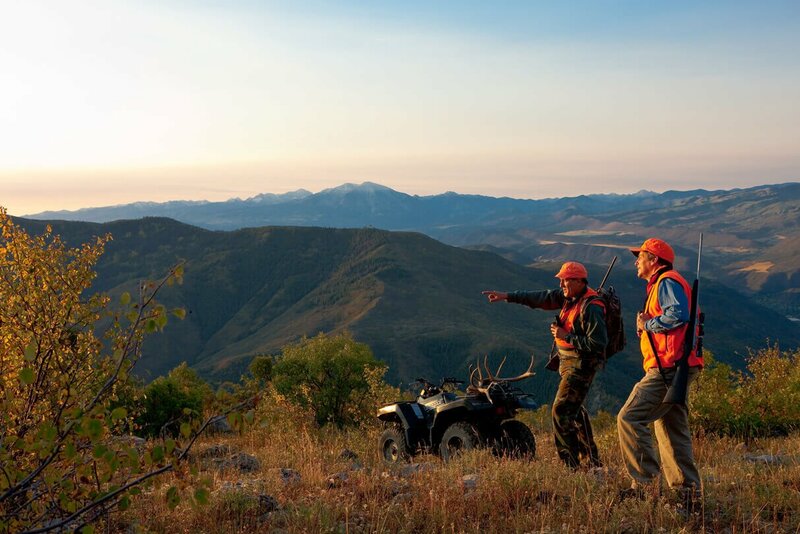 For more detailed information about hunting in Glenwood Springs and for licenses, visit the White River National Forest and Colorado Parks & Wildlife. Iron Mountain Hot Springs welcomes Colorado hunters and wishes you the best of luck this season.